A view from the cycle path: Is that a shared use path ? Do Dutch cycle paths cause conflict with pedestrians ? Is that a shared use path ? Do Dutch cycle paths cause conflict with pedestrians ? Anywhere that walking is commonplace, the Netherlands builds specific infrastructure for pedestrians. You'll find this alongside cycling infrastructure through most urban areas, and the walking infrastructure is generally wide and of good quality. Conflict between cyclists and pedestrians is avoided because both cyclists and pedestrians have high quality infrastructure of their own. At this location next to a school, there is both a four metre wide cycle-path and a 2.5 m wide walking path. An appreciable number of pedestrians are anticipated in this location. Cars cannot be driven parallel with these paths. There are also very obvious walking paths separate from cycle-facilities in the city centre. Motor vehicles are allowed to access this area only for loading and unloading at set times. Though it's not heavily used by foot, this secondary quality cycle path (3.2 m wide) connecting suburbs to the city has a 2.5 m walking path alongside it. The road alongside has a 50 km/h (30 mph) speed limit. In rural areas where distances are longer, for instance between villages or on routes connecting villages to cities, you wouldn't expect to see a separate walking path. This is because few people would choose to make journeys of several kilometres in length by walking. It simply takes too long for practical journeys. But the cycle-path along which this racing cyclist is riding in the countryside has no separate pedestrian facility. The sign shows this to be a cycle-path shared with low speed mopeds (this is normal between towns but they're banned in towns), not a shared use cycle/pedestrian path. The road alongside has an 80 km/h (50 mph) speed limit. On small rural roads in the Netherlands there may be neither separate cycling infrastructure nor separate walking infrastructure. But in these areas it can usually be expected that traffic levels are very low. Driving routes are unravelled from cycling routes in the countryside as well as in towns. In a recreational area, unsurfaced paths like this may be used by both cyclists and pedestrians. However, most people cycle to events like this. Such paths are not used as through routes by bike and there's no motor vehicle access except for maintenance. 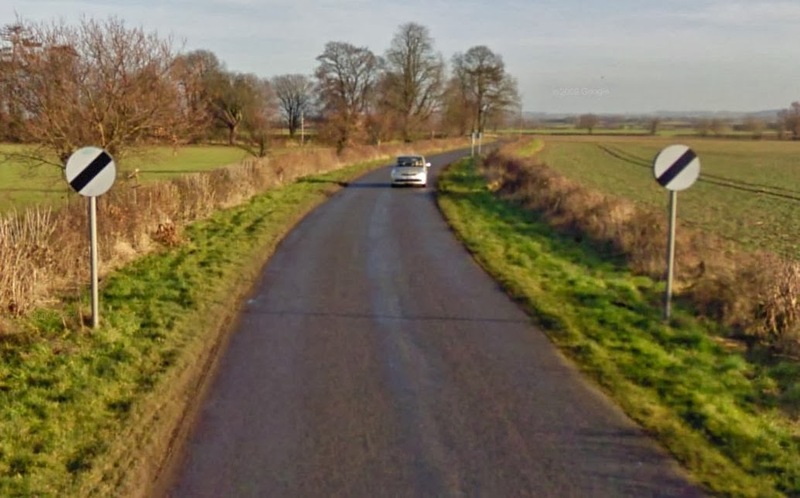 Even many of the small country roads in the UK which cyclists and pedestrians both seek out to avoid the heavier traffic still have 60 mph (100 km/h ) speed limits. The idea with regard to pedestrians is the same in both countries. Pedestrians are provided for only where there are expected to be appreciable numbers of pedestrians. While decisions about whether to built pedestrian infrastructure are similar in the UK and the Netherlands, cyclists are catered for far more favourably in the Netherlands than in the UK. This pays dividends for pedestrians as well. People who like to walk long distances are better provided for in the Netherlands than in the UK because instead of walking on roads with high speed traffic, they may use cycle-paths between towns to make their journeys by foot. This is far safer than walking on the road. Within town where there will be an appreciable number of both cyclists and pedestrians, both parties are better off in the Netherlands than they are in the UK because cyclists and pedestrians are each provided with their own separate infrastructure and conflicts between them are minimised. These benefits are not only for the able-bodied but also for people with disabilities, though of course in the Netherlands many people with disabilities choose to cycle because that option is so much more attractive given safe conditions. See also how nearly car free town centres have improved conditions for pedestrians and how pedestrianized shopping centres in the Netherlands permit cycling, but are not through routes by bike.